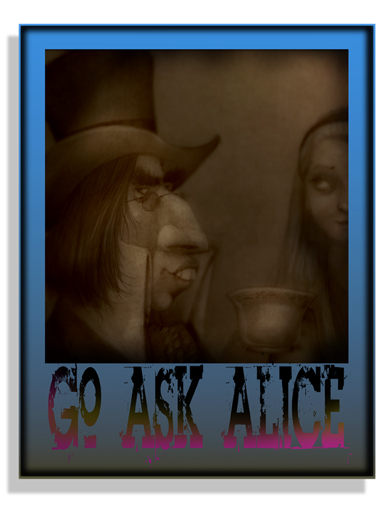 This is would be Lewis Carroll's "Through The Looking Glass" told from the Hatter's point of view. It was a mistake for Tom Petty to let his unibrow grow back. The dark tones bespeak intrigue, perhaps danger. My take on Carroll's work has always been dark and twisted. The Disney version is an insult to Carroll's deeper meaning. Sounds suspiciously similar to "Confessions of a Mad Hatter" (that was one of the first illustrations I saw after drifting here from C&F). I've never seen the Disney version. My father took me to see an early 70s English musical version. I was six, & I remember it vividly. It was disturbing to me then, but I appreciated the memory of it when I later read the book. My dad occasionally took me to the movies on Saturdays. There were two matinees. We would get there in the middle of the first one & leave during the second one where we walked in on the first. Yes, movie theaters used to tolerate such things. No ushers, the floors were clean, & folks here still operated on the honor system. It's a LONG story to explain why he did it that way, & it drove me nuts when I was a kid. On the plus side, there were no ticket lines, no concessions lines, no parking hassles, & there was no exit traffic--& I knew what in medias res was long before any of my friends did. I like to re-vist themes to explore new angles. I did that prior piece about five years ago. I like this one much better. Childhood memories have a way of haunting our adulthood in such interesting ways, eh? This page contains a single entry from the blog posted on August 12, 2012 12:09 AM.